Bleaches and highlights your hair strands without damaging hair structure. Blondor is a Wella bleaching haircolor line to create a natural fresh and blond result. It provides up to 7 levels of lift in natural or color-treated hair. Blondor Multi Blonde Powder is a bleaching dust-free powder that quickly turns into a creamy texture to light up your strands. Specially designed with Tri-Lightening technology with efficient molecules of anti-yellow action to promote a fresh, clear and bright blond result. Extra Cool Blonde Powder is a bleaching powder to provide a lightening and toning action. It creates results perfect cold blond results. Suitable for natural hair pre-colored hair from tone depth 4-8 for all application techniques. Blondor Soft Blonde Cream softens and moisturizes hair. Enriched with chamomile extracts to soothe and soften hair and scalp. Lipids coat the hair fiber and protect from moisture loss. Recommended for on-scalp techniques. Blondor Multi Blonde Powder: Apply the bleaching mass evenly to the unwashed hair. The development time depends on the condition of the hair and the desired blonde result. Carefully check hair every 5?10 minutes during process. The maximum total development time is 50 minutes. Mix with Koleston Perfect Crème Developer 1.9% or 4% in a non-metallic bowl. Mix in a ratio of 1:1.5 up to 1:2, e.g. 30 g powder + 45 ml Koleston Perfect Crème Developer. If there is contact with the scalp (global or root application), use a 6% activator as a maximum. Extra Cool Blonde Powder: 1ST-TIME HIGHLIGHTS ON VIRGIN OR PRE-COLORED HAIR: Apply the bleaching mass evenly to the unwashed hair. The development time depends on the condition of the hair and the desired blonde result. Depending on the desired degree of lightening and consistency, mix Blondor Extra Cool Blonde with Koleston Perfect Crème Developer 1.9% or 4% in a ratio of 1:1 up to 1:1.5 in a non-metallic bowl. HIGHLIGHTS ON ALREADY HIGHLIGHTED HAIR: Apply the bleaching mass evenly to the unwashed hair. The development time depends on the condition of the hair and the desired blonde result. As the toning is more diluted, you have more flexibility with regards to the development time than when using the pure product. Note: For time-consuming full-head foiling techniques we recommend working with a lower strength of Koleston Perfect Crème Developer. Mix 1 part Blondor Extra Cool Blonde and 1 part Blondor Multi Blonde Powder with Koleston Perfect Crème Developer 1.9% or 4% in a ratio of Blondor mix : Developer of 1:1 up to 1:1.5 in a non-metallic bowl. ROOT APPLICATION/FULL-HEAD APPLICATION: Apply the bleaching mass evenly to the unwashed hair. The development time depends on the condition of the hair and the desired blonde result. The more you dilute the product, the more flexibility you have with the development time. Always apply the product to the roots first and then, in the last 3?5 minutes, to lengths and ends. Mix 1 part Blondor Extra Cool Blonde and 1 part Blondor Multi Blonde Powder in a ratio of Blondor mix : Developer of 1:1 up to 1:1.5 in a non-metallic bowl. 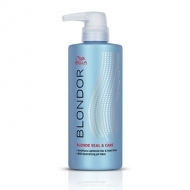 Blondor Soft Blonde Creme: Apply the bleaching mass evenly to the unwashed hair. The development time depends on the condition of the hair and the desired blonde. Carefully check hair every 5?10 minutes during process. The maximum total development time is 50 minutes. First Time Application: First, apply to mid-lengths and ends, then finish by applying to the root area. Mix with Koleston Perfect Crème Developer 1.9% or 4% in a ratio of 1:1 up to 1:2 in a non-metallic bow. If there is contact with the scalp (global or root application), use a 6% activator as a maximum.